Today’s book review is for Morgan on Ice, written by Ted Staunton, illustrated by Bill Slavin, published by Formac Publishing. This book is scheduled to be released on March 1, 2014. I received an electronic copy of this book from the publisher, through NetGalley, in exchange for an honest review. 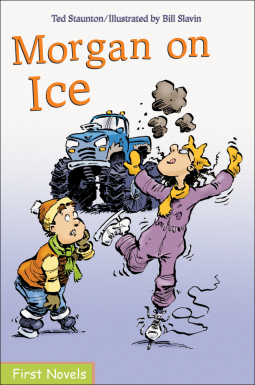 Morgan on Ice is part of Formac’s “First Novels” line, which are early chapter books targeted at 6-9 year old children. Morgan is a boy. I mention this because until I reached the end of chapter 2, I had thought Morgan was a tomboy. So, Morgan is a boy who has to spend a lot of time with a girl he doesn’t much like, Aldeen, who is a family friend. She has invited him to see a Princesses on Ice show, and Morgan’s mother accepted the invitation. But Morgan isn’t interested in princesses and he doesn’t like ice skating. When he gets invited to the Monster Truck show by another friend, Morgan does all he can to weasel out of his engagement with Aldeen. I struggled to make my way through this book. While I’m obviously not the target audience, often I enjoy reading books for this age range. Staunton’s prose was just tedious. The book is written in the first person from the perspective of the protagonist, Morgan. I think that Morgan is supposed to be sympathetic, but he came across as whiny. A lot of the narrative focuses on what Morgan doesn’t like, which leaves him a bit flat as a character. He never really develops, either. I’m not even sure what the takeaway message for the book was supposed to be: ice skating is better than monster truck rallies? Slavin’s black and white illustrations have a lot of movement and a playful style. However, often details get lost in an excess of line/scribble shading. It might be an issue of scale–perhaps if the images were larger, this wouldn’t be a problem. But as they were, they came across as too busy; my eye never knew where to focus. None of it worked for me, so I’m going with 1 out of 5 stars. This book was mediocre, tedious, and pointless. Maybe I could have even forgiven the lack of any real character development or message if the book had been entertaining. But it wasn’t. 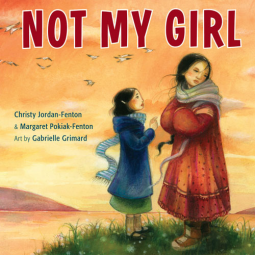 Today’s review is for Not My Girl, written by Christy Jordan-Fenton and Margaret Pokiak-Fenton, illustrated by Gabrielle Grimard, published by Annick Press. It is scheduled for release on February 18, 2014. I received a free electronic copy of the book from the publisher, through NetGalley, in exchange for an honest review. 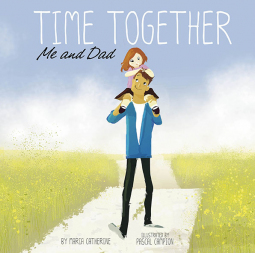 In this beautiful picture book memoir, Margaret Pokiak-Fenton recounts her return to her family after spending two years at a Canadian residential school. When Margaret steps off the boat to return to her village, her mother uses her limited English to declare “Not my girl.” This is the beginning of Margaret’s journey of re-integrating to her familial culture after two years of assimilation. She finds that she has forgotten most of her language and fumbles at chores that used to be easy. Even her father’s sled dogs, with whom she used to share affection, treat her as an outsider. This is a moving story that opens a window to a troubling period of history. However, its uplifting ending will reassure children that no matter how much they grow and change–they can always return to the love of their family. Although I had heard about residential schools for First Nations children, this was my first time actually reading about their impacts. While it seems that the staff at the school treated Margaret with kindness, her narrative reveals that they still caused unintended harm to many children. The pain of facing rejection by their families after returning as outsiders must have left psychological scars. I am thankful that she chose to share her story, thus giving younger generations the chance to learn about a piece of history that seems not to be discussed very often. The writing has a plainness and clarity to it, which is punctuated by moments of poetic imagery. It’s a style that works well. The narrative voice captures the emotional tone of a 10-year old girl, overlaid with the reflections of a grown woman. Children should be able to connect with the voice of the child, while parents will appreciate the perspective of revisiting the past. Grimard’s soft illustrations provide a beautiful complement to the story. The abundance of orange-tinted light in her pictures perfectly captures the feeling of Arctic winter, where the sun is always low on the horizon. At the same time it also creates a sensation of familial warmth. Most of all, I loved how deeply expressive the characters were. Every face evoked a strong emotional response. Whenever she drew Margaret as a sad young girl, I felt an ache in my heart. I love when an artist is able to elicit such a reaction. I can’t recommend this book highly enough. I’m giving it a full 5 stars for being such a powerful and moving work. It provides abundant opportunity to talk with children about history, Inuit culture, assimilation programs, geography, and family dynamics. 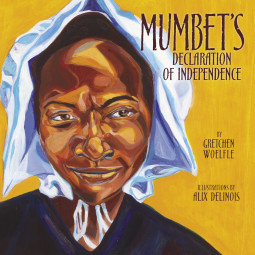 The book is targeted to readers in grades 1-4, although I think it could be enjoyed by a much wider audience. 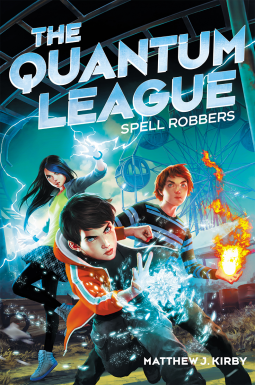 Today’s review is for The Quantum League #1: Spell Robbers, by Matthew J. Kirby, published by Scholastic. I received a free electronic copy of this book from the publisher, through NetGalley, in exchange for an honest review. Ben Warner has always felt a bit of an outsider. It’s probably because his eccentric mother is always moving them around to new places. When he’s invited to participate in an elite science camp, Ben decides to check it out. After all he likes science, and it means he won’t have to hang out at his mother’s office in the afternoon. He discovers that the camp is actually part of Dr. Madeleine Hughes’s research into Actuation–the ability to change reality through imagination. Even more exciting, Ben seems to be a natural. When a mysterious group of men show up to the lab one day to abduct Dr. Hughes and a prototype device, Ben and his friend Peter quickly find themselves in the middle of a war. It turns out that the world of Actuation is much bigger than they ever imagined–but will they be able to rescue Dr. Hughes before it’s too late? Kirby has crafted a fast-paced science-fantasy adventure for the middle grade set. His plotting and pacing are spot-on. I found myself completely wrapped up in the story, frantically turning the pages to find out what would happen next. Every time I thought I had figured something out, I was thrown an unexpected twist that kept me on my toes. This in particular impressed me, because too often middle grade fiction feels predictable. While some aspects of the story feel grounded in common comic book story-lines, it is still refreshingly original. I was pleased with the range of characters in the book, as well as their development. Ben, the protagonist, is an intelligent boy who cares deeply for his mother, no matter how much she frustrates him. Initially he is excited to discover that he can Actuate. But when the Quantum League wants to recruit him to their organization, he has little interest in getting involved. Even when he learns that he’s one of the most talented people they’ve seen, Ben would gladly give up his abilities to return to his mother’s side. Peter, while jealous of Ben’s natural talent, remains a loyal and trustworthy friend. Few of the secondary characters are quite who they seem to be at first guess–which is fun. I can’t wait until the next book in the series is released! I’m hooked. This would be a great choice for middle grade readers who enjoy action, comics, and science-fantasy. It definitely has the potential become a new hit series for the 9-12 set. This volume gets a full 5 stars for being awesome. Sure, it has some great themes and messages for kids, but in this case I’d rather just focus on it being a fun read. Today’s book review is for Breakfast With Bigfoot, written by Amelia Cotter, illustrated by Charles Swinford, published by Black Oak Media. I received a free copy of this book from the author in exchange for an honest review. While young Gretchen is on a camping trip with her family, she decides to go for a short walk in the woods. She notices that the sun is getting low and starts to head back to camp–only to find that she’s lost. She does not, however, lose her wits. Instead, she thinks back to lessons from nature camp and decides to wait until someone finds her. She just never expected that it would be Bigfoot who finds her! This humorous story offers young children sound advice for basic outdoors skills. This is one of those cases where I’m actually shocked that the publisher printed the book as it exists in this edition. The writing is sound. The illustrations are nice. The book design, however, is terrible. The paper is of such low quality that the text shows through to the other side of the page–which sometimes muddies up the illustrations. The font selection is pretty tacky. And for a target audience of 3-6 year old kids, there is far too much text on each page. 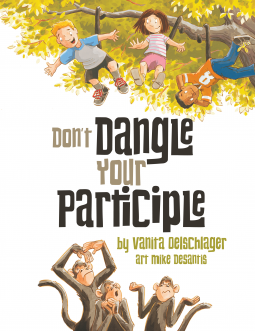 At one point, I was tempted to just scan the illustrations and re-design the book for myself. The good news on this front is that a revised edition is in the works. I’ve been told that it will be printed on higher quality paper and will feature some layout changes. When I started reading the book to my daughter, she was interested in the story. 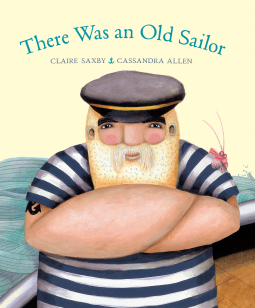 As a parent, I found that the text was fairly easy to read aloud and had a kid-friendly tone. There were a few moments where it felt like narrator asides were talking down to the audience a little. “Oh no! Gretchen is lost!” is one such example. We’ve just heard that she doesn’t think she’s on the right path–the target audience should be able to deduce that she’s lost without it being spelled out. There are other places where the prose could be tightened up a bit. 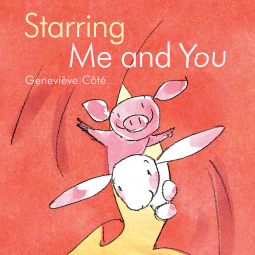 Overall, though, the story flows smoothly and has a good balance of humor and teachable moments. Swinford’s pencil and watercolor illustrations are fun. I really enjoyed the facial expressions and body language of both Gretchen and Bigfoot. The pictures complemented the text nicely. They made it easier to understand what was happening in the story. My primary complaint with the illustrations was that I wished there had been a few more. For the age group of the target audience, the visual element is important. There were no full-page illustrations–but there were full pages of text. The text and imagery balance was way off for a picture book. This has been an incredibly difficult book for me to evaluate. Poor design is one of the biggest hurdles for me to get past when reviewing a book. I feel like the book itself earns 2 stars, while the content merits 3 stars. But I’ve got high hopes for the revised edition. I love that Cotter is working to teach young kids basic survival skills–stay calm, stay in one place, don’t eat strange foods. As a parent who already takes her daughter hiking and plans to take her camping soon, too, it’s nice to have a resource like this available. Cotter’s onto a great idea; now she just needs the editorial guidance to help her shine.